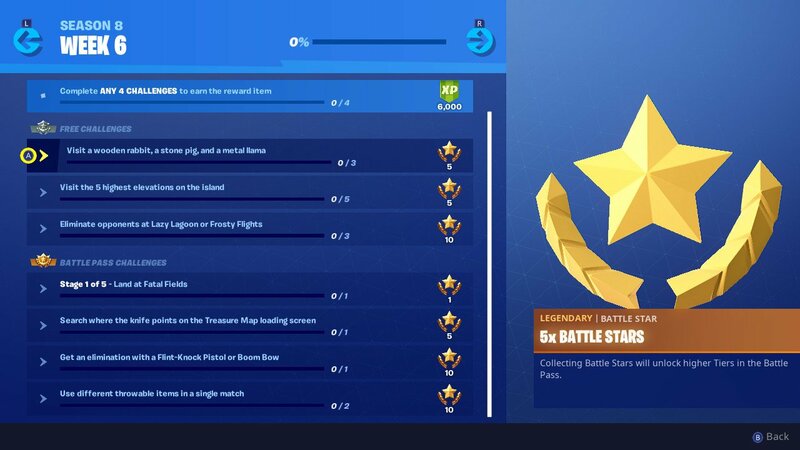 The Fortnite season 8, week 6 challenges are up and we’ll be helping players tackle a free one called “visit a wooden rabbit, a stone pig, and a metal llama.” It’s a type of challenge that players may be very familiar with as we’ve encountered it plenty of times in the past, but it can still require a bit of guidance, even if you’re a veteran to the game. Before we begin, though, we’re going to go over all the challenges for this week so you know what you’re up against. Then, we’ll hop into how you can complete this elusive challenge. We also threw together a bonus guide on how to find and visit the 5 highest elevations for this week’s challenges as well. Anyways, let’s get started. The season eight, week six challenges are available right now in Battle Royale. As usual, there are three challenges that are only available to free players while the other four are for players who own this season’s Battle Pass. Thankfully, if you did the overtime challenges last season, you probably already have it. If you don’t have the season pass for some reason, we recommend you jump on it right now. If you wait to do so after this week, it’s hard to justify getting it as you won’t have a ton of time to get the sweet rewards like those awesome Battle Royale skins. If you want to see what challenges are available this week, be sure to check out our handy screenshot above. Fortunately, this week has some really awesome challenges that sort of make up for the less than stellar past few weeks. What’s even better is that there are several exciting new challenges that we recommend everyone does. The best part? The two main challenges are both available to free and season pass players alike. Here are a couple of tips before we get started. This is a three-part challenge but you don’t actually have to visit all three locations in a single match. So, if you run out of time, don’t worry as you can certainly do the rest of the challenge in the next match. If you’re only looking to get this challenge done and don’t care about actually playing through the different matches, we recommend that you just visit the locations and then bounce from the match. It will still count for you and it will save you some valuable time in the long run. Lastly, we recommend that you do this challenge in the Team Rumble mode so you have plenty of time and fewer enemies to worry about. If you want to complete this with your friends, make sure to turn on Party Assist in the challenges tab so it counts for you if they find a spot. The three spots we need to visit are locations on the outskirts of the map that players don’t usually visit. This makes this a rather easy challenge to do as you’ll probably only run into players also completing the challenge. The first up is the wooden rabbit location. The wooden rabbit is a massive wooden structure that is made of, well, wood. It is found on the western edge of the map. The exact location for this first animal structure is just north of Snobby Shores and slightly southwest of Haunted Hills. In between those two locations is a little plateau that you can see on the map itself. 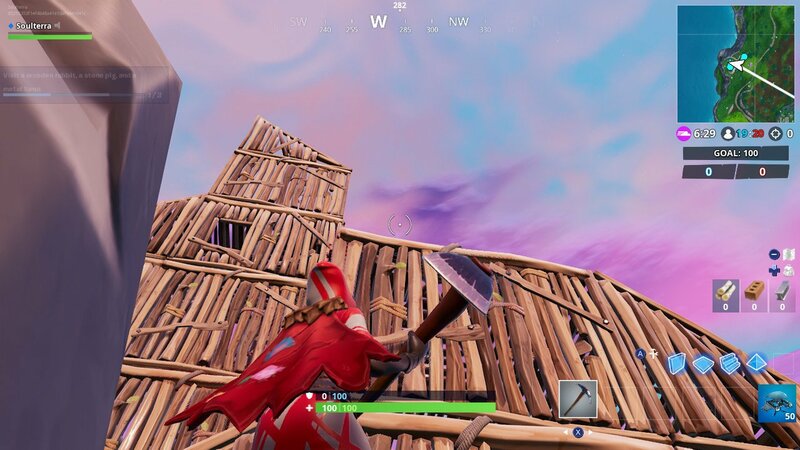 The wooden rabbit’s exact location is in the A4 square on the Fortnite map. All you need to do is visit this hill where the wooden rabbit is overlooking the coast. You will probably need to build yourself a ramp up to the structure so you can get close enough for the visit to count. You will know it works when you see a notification in the top left corner of your screen noting that you’ve visited the first of three spots. Now it’s time to head down south for the next location. Next up is the stone pig. This, too, is a rather new animal structure that we have never seen before. Like the wooden rabbit, the pig is a massive monument made out of building materials. It honestly looks like something that a player could build themselves rather easily. This time, we’re heading to the southern edge of the map. The exact location that we need to head is right between the grassy plains and the desert. The stone pig can be found right in the small area in between the desert on its eastern side and Lucky Landing on its western side, overlooking the cliffside to the massive ocean by it. The exact location of the stone pig on the grid map is right on the edge of the F10 and G10 squares on the map. Head here and walk up close to the stone pig until the game notifies you in the top right corner that you’ve completed this second stage. Time for the final animal structure location. For the final part of this season 8, week 6 challenge, we are going to visit an old friend. 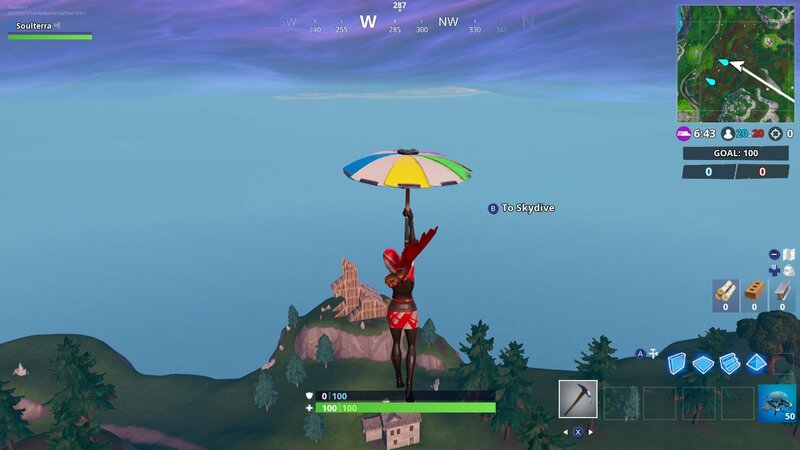 If you are a Battle Royale veteran of past seasons, it is likely that you already know where the metal llama is. After all, this particular metal animal has been around since nearly the start of Fortnite Battle Royale. But if you have forgotten or simply don’t know where it is, you can find this familiar location at the northern edge of the map. More specifically, the northwestern edge of the map right near Junk Junction in the small space in between the named location and the ocean. This massive metal animal is also overlooking the ocean and can be easily seen from a distance so it should be easy for you to find once you reach this area. 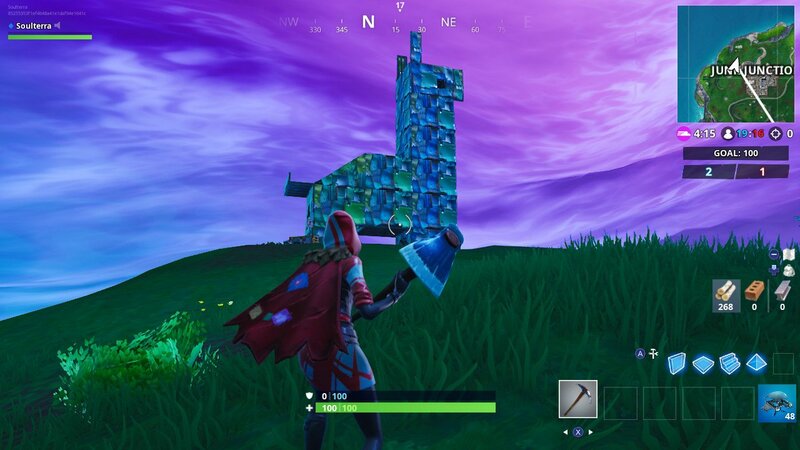 As for its location on the grid map, you can find the metal llama in the B1 square on the map. 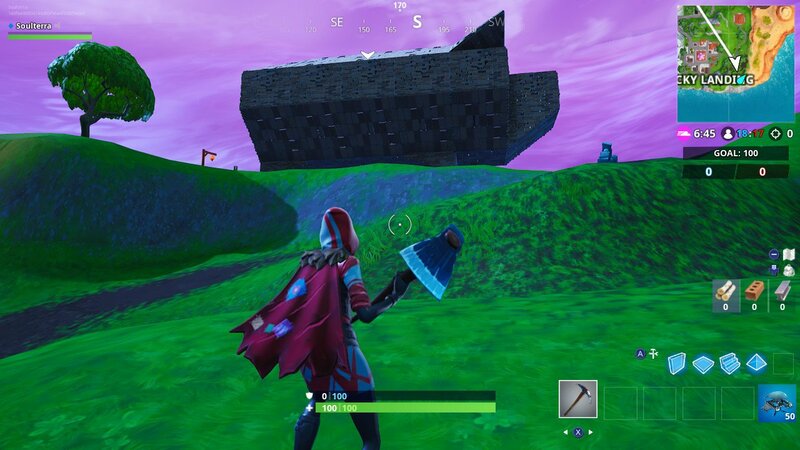 All you need to do is head to the metal llama and get close enough to it until the game notifies you that you have completed this challenge. If you do plan on finishing the match you’re in, the llama does hold a lot of hidden treasure chests so be sure to loot it up while you’re here.